The rotating trommel can screen the most difficult materials making the best possible use of the load-sensing material feed and the large screening surface. The hydraulically controlled discharge conveyors are ready to go within less than five minutes. 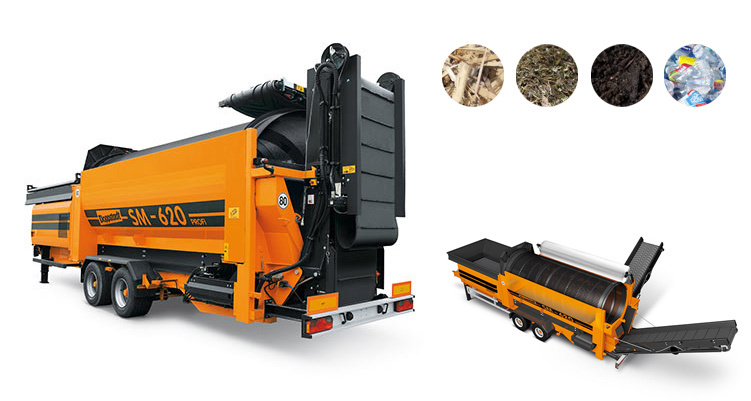 A rotating, hydraulically controlled brush cleans the trommel automatically. The machine level is adjustable for stability and a good throughput. If the machine must be moved, a slip-on coupling for the drawbar is available. Our SM 620 works with a trommel with a 2 m diameter and a length of 5,5 m. The trommel wall thickness is 6 – 12 mm. Different meshes are available e. g. square holes, staggered squares and round holes. Have you found the right Machine?